London is one of the most expensive cities in the world to rent a home. And understandably, if renters are paying top dollar, they expect their apartment to offer that luxury lifestyle – a sophisticated home where they can simply unpack their belongings and get on with their life. So while we continue to see high rental demand across the areas covered by our 16 London lettings branches, top notch presentation remains as important as ever if you wish to let your property quickly and for the maximum market rent. Unfurnished properties (particularly smaller ones) can take 30% longer to let – even in the current, strong rental market. In fact, about 80% of applicants looking for a property prefer it to be fully furnished. 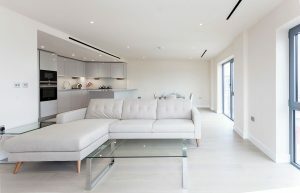 Even brand new apartments take longer to let if they are unfurnished. Why? A new apartment may be a blank canvas but it lacks character – that homely feel. When a new building launches, there is a lot of competition from virtually identical units, so stylish furnishings allow a property to really shine and stand out from the crowd. If applicants can picture themselves living in the apartment, they are more likely to fall in love with it and make a swift offer. Most of our landlords recognise this and factor furnishings into the start-up costs of their buy-to-let property. But how much should you spend? This will be determined by your target market – a professional with a good accommodation budget will expect stylish, high quality furnishings to match their aspirations and reflect their status. Students will probably be content with a good, but more basic standard. As a rough guide, we usually recommend landlords spend around 1.5% of the value of the property on furnishings, including accessories, cutlery, linen etc. Furnishing a property yourself can be time-consuming and you may not have that elusive ‘designer touch’ so you could consider a furnishing pack for your rental property – a cost-effective, practical and simple option. If you are considering using a furnishing pack for the first time and would like to chat about the options, please contact your nearest Benham and Reeves branch. Rental demand in the City and East London remains strong. We’re seeing an increasing number of Spanish and Italian professionals relocating to the City and Canary Wharf at the moment, mainly working for tech and finance companies. We have waiting lists of referenced tenants looking for properties in the City. One Blackfriars is very much a luxury development but demand here is high. But generally the continuing problem is a lack of affordable stock – particularly apartments priced at up to £600 per week which are popular with budget-conscious young professionals who are cautious and wish to keep living costs to a minimum. 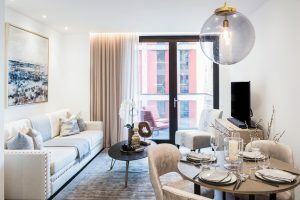 Apartments priced up to £600 let immediately and, with a shortage of apartments at these price points in the City, many tenants are moving further out, to Canary Wharf or Stratford, as there is greater choice of these properties. Offering a high spec and reasonable commute, these apartments represent real value and convenience. As a result, our Surrey Quays, Canary Wharf and Greenwich branches are very busy as they have more of this well-priced stock. Our Canary Wharf branch is probably our busiest at the moment as stock levels here are higher so we are able to fulfil tenant demand, although we are always looking for new instructions as we have plenty of applicants waiting to move here. this should gradually help to alleviate shortages of stock. Across East London, tenancy renewal rates remain high and most tenants are happy to sign a one year tenancy agreement with no break clause, sometimes longer. Demand from applicants is good in central London, with our Kensington, Knightsbridge and Hyde Park branches reporting that enquiries are increasing as we move into the spring. The highest demand is from young professionals – singles and couples – usually looking for one or two bed properties in the £400 – £700 price bracket. Enquiries are also coming in steadily for two and three bed properties priced at £895 – £1400 per week. We do have some shortages of stock at the moment, particularly of smaller properties, and this is driving up rents slightly in some areas. Period properties and new-build homes are letting well and both are popular, with an applicant’s choice depending on whether they are looking for the more generous space and traditional charm offered by period buildings (which are popular with US applicants) or the contemporary, high spec of new-builds which tend not to be as spacious though. Tenancy renewals remain at a high and most landlords are happy to be flexible, negotiating on rent to retain a good, reliable tenant. 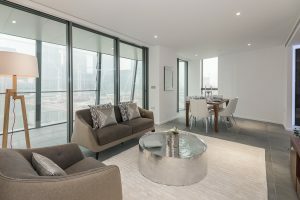 Last month saw the launch of Thornes House at The Residence, a popular development in Nine Elms. Our local Nine Elms branch is handling enquiries here where we have a selection of one, two and three bed apartments available. Properties here and in other local developments, including the well-known Battersea Power Station, always tend to let quickly and we are starting to see professionals moving here from more traditional areas such as Chelsea, drawn south of the river by the high spec properties and excellent amenities. In North West London, rental demand in Highgate and Hampstead has been a little slower than usual but is picking up again now. We have shortages of smaller apartments, partly caused by the high numbers of tenants renewing, meaning not much stock is coming back onto the market. Tenancy renewals are at 85%–90%, against 60%–70% which is what we would normally expect to see. Most landlords are happy to retain a reliable tenant at their current rent rather than risk a void, while tenants are renewing for a second or even third year, staying in their current property unless their circumstances change and they need to move away. 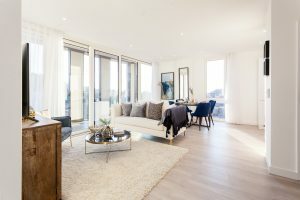 New developments nearby such as Woodberry Down remain popular and we are currently receiving instructions from Chinese and Singaporean investors who own apartments in its new phase, the Sandpiper Building. These apartments are letting almost immediately. 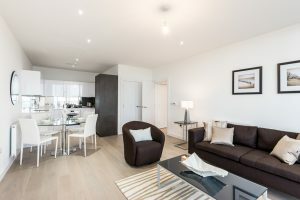 At Beaufort Park in Colindale, rental demand remains good and apartments are letting well. Relocation agents are busy looking for homes on behalf of corporate professionals, many working for the well known tech companies moving to new offices in Kings Cross. We have good stocks though to meet the strong demand. The latest phase at the development, the Castleton Apartments, launches in April and we are already talking to a number of landlords planning to let their apartments in the new building. Lack of stock remains an issue at many of our West London branches – Fulham Reach, Ealing, Kew Bridge and Imperial Wharf, due to the very high demand. Our Fulham Reach branch is seeing an influx of enquiries for Sovereign Court and Fulham Reach but stocks are low. The latest phase launching over the summer at Fulham Reach is The Henley Apartments and we are confident demand will be strong. With Hammersmith becoming such a rental hotspot, nearby developments such as King Henry’s Reach and Queen’s Wharf are also letting extremely quickly. Good demand continues at both Dickens Yard in Ealing and Kew Bridge in Brentford but again stocks are low and we continue to look for new instructions from landlords. Rents are steady and most apartments are achieving close to asking rental. We have been taking on new instructions at Harrow Square in Harrow which is attracting a lot of interest from professionals while our Kew Bridge branch is handling enquiries for Queenshurst Square in Kingston – both developments are proving to be very popular.